Marfa Public Radio gladly accepts Public Service Announcements (PSAs) from registered not-for-profit organizations and other community groups providing free events and services. To submit a PSA, use the submission form at the bottom of this page or email us at PSA@marfapublicradio.org. Marfa Public Radio is happy to partner with our community to help publicize local events. However, since air time is limited, the station cannot guarantee that all PSAs will be broadcast. 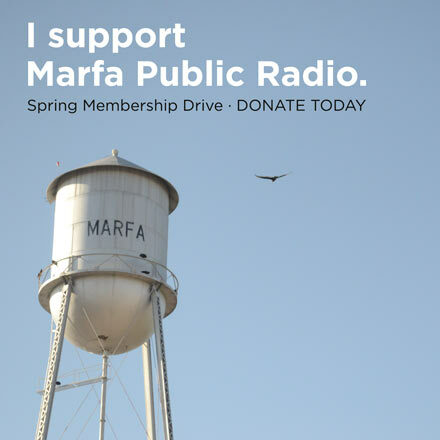 Individuals and community groups interested in guaranteed spots on Marfa Public Radio are encouraged to purchase underwriting with the station. Length- Your requested script should be around 75 words total. Prices – if the event is free, please mention this. If it is not free, do not list ticket prices. If the event is a benefit for a non-profit or involves donations, just describe the event — do not refer to donations, auctions, or benefits, etc. Cultural events – for arts events, include program highlights (artists or headlining band, for example). Non-commercial tone – never use call-to-action verb phrases (example: don’t write “call..,” or use phrases like, “join us for…,” “come celebrate…,” “visit…,” or “you’re invited to…”). We appreciate your help maintain the distinctive, non-commercial delivery that is highly valued highly by our listeners. Language – Marfa Public Radio does not air PSAs with comparative language (“The best in Alpine” etc). Religious events, excluding concerts and other non-religious events at churches, synagogues, and other religious venues, or temporary relocation of services. Routine or regular meetings of an organization. Commercial events, or other events where there is an emphasis on ‘selling’ or ‘bidding’, including silent auctions, yard sales, bake sales, artist markets and craft fairs. Membership-only events, car washes, or lost animals.